How does that song by Gladys Knight start? Single guy in the big city! – Humboldt Fog. A cheese made from fine goat milk. Made by California’s own Cypress Grove Chevre. – Zoe’s Uncured Ghost Pepper Salami. Ghost pepper is 900.5 times hotter than Tabasco sauce. The salami makers added tequila and cilantro to round the flavor. – A bottle of Old Zin Vines Zinfandel. This Lodi wine is red, intense and very friendly. Like an old Daffy Duck cartoon, smoke came out of my ears when I bit into the Ghost Pepper salami. A dab of the Humboldt Fog cheese put out that fire. The mixture got me high. And then the sips of Zinfandel? Let’s just say the world outside couldn’t touch me! Until my roommate broke down the door on Sunday night, finding me foaming at the mouth. Having stripped down to my Superman briefs sometime Saturday afternoon, (I don’t know cuz time doesn’t exist in my closet), I sat in the shower for 2 hours. Civilization stormed back into my life, unfortunately. When I first set foot in Fancifull Fine Foods and Baskets in November 2010, I didn’t know what to expect. I only knew they made amazing wine gift baskets, fruit baskets and many other wonderful gifts that I’d feel privileged to receive. I had received a call from my Mom saying that her friends needed help in their production line for the Christmas season. So off I went…into the world of gift baskets! 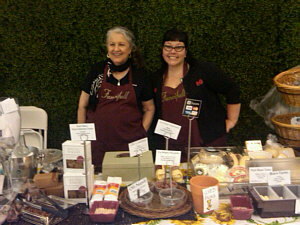 Lauren Walko (right) and Susan St. Charles working the Fancifull Booth at the Artisanal Festival in Santa Monica. 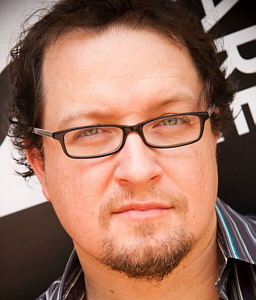 The teamwork that goes into every facet of the business was astounding. Working in the production area proved to be a delightful mix of controlled chaos and constant motion. All the baskets/bows are handmade to order, artisan foods are carefully selected to create a delicate blend of flavors and the finishing touches are never overlooked with any order. From the small individual orders for holiday gift baskets to the large and extravagant custom baskets, everything looked like it was fit for royalty (and sometimes it was!). The amount of dedication that was poured into every design made me feel proud to be a part of it all. It was a wonderful way to start my career at Fancifull, as it let me see the end product of all the hard, time-consuming work that goes into designing every gift that leaves the building. I knew that I had to learn more about this business, about what it takes to run every aspect of it all. It was only 1 month after the Christmas season had ended when I returned to Fancifull, only this time, as a permanent employee… an Assistant Buyer. We are really happy that several of our favorite cheese makers won big awards at the American Cheese Society Meeting and Contest held recently in Montreal, Canada. We’ve been championing and selling their cheeses for years, so it’s really fun to see them getting the accolades they deserve for their delicious products and dedication to their craft. Among the winners was Point Reyes Toma cheese for Best Original Cheese. We’ve been including this in our gift baskets for some time now as well as sampling and selling it at our local Farmers Markets. Their fabulous Mozzarella, which we got to taste last week when we visited their creamery, won a second place award. Unfortunately it’s currently only available at the creamery in Point Reyes, CA. We’ll let you know if that changes. (Meaning we’re going to get it if we can!). Their Original Blue cheese also won a big award recently when it was awarded the title of Best Dairy or Cheese Product of the Year at the Fancy Food Show in Washington, DC. Go Point Reyes! Another big winner at The America Cheese Society was Beehive Cheese which is located in Utah. They won awards for their Barely Buzzed, Seahive and Promontory Cheddars, all of which have been included in our gourmet gift baskets. You can read more about their cheeses in an earlier blog we wrote on Beehive Cheese. Flavio DeCastilhos of Tumalo Farms in Bend, Oregon also won awards. His Classico, a Gouda style Goat Cheese, is simply amazing. Just this morning I greated some of it very finely and cooked in in with some scrambled eggs with fresh basil and some chopped Jeaune Flamme tomatos from my garden. Ooh la la la la, I’m getting hungry again just thinking about it. I published the recipe in a previous blog on Tumalo Cheese. And then there’s Beechers Handmade Cheese of Seattle which won awards for three or four of their Cheddars. 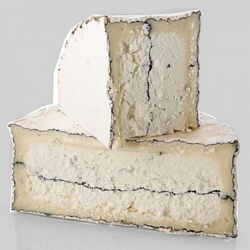 We carry their Flagship cheese – rich, full flavored, creamy, and extremely popular with everyone who tastes it. I’d recommend this in any of our beer gift baskets. It also makes for a killer macaroni and cheese. Haven’t yet tried any of these cheese yourself? Call and order some from us – you’ll be very, very, very happy! 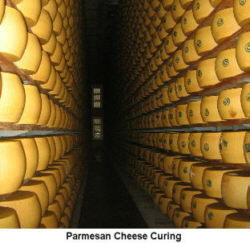 Is there some cheese you know of that we should try? Please let us know! If there’s good food involved, we’re interested.